Last month, I challenged you with a naked-eye test. This month, we have the polar opposite: Einstein's cross. One of the predictions of Albert Einstein's 1916 General Theory of Relativity was that the light from a bright, far-off source of energy would be warped, or "bent," around a massive object lying between that source and an observer. In the process, the time it takes the light to reach an observer would be altered, causing the background object to appear magnified and distorted. That was what Einstein's theory said, but how could it be put to the test? The most massive nearby objects known at the time, such as the Sun, were also very bright. Anything that happens to lie beyond would be so faint by comparison that it would be rendered invisible. Sir Arthur Stanley Eddington, Britain's leading astrophysicist at the time, came up with the solution: use the Sun anyway. Not just the Sun on any given day, however, but rather during the total phase of a solar eclipse, when the Moon's disk completely blocks the blinding photosphere. The upcoming eclipse of May 29, 1919 would be perfect. Not only was totality unusually long, the Sun would be located right in front of Taurus's Hyades star cluster. There would be plenty of stars in the Sun's vicinity to test Einstein's theory. Although his expedition was touch and go because of everything from clouds and rain to the clouds of World War I, Eddington's observations recorded stars beside the Sun that should actually have been positioned behind its edge at the time. Einstein was right; gravity could warp light. This warping effect is known today as gravitational lensing. Photographs taken with the Hubble Space Telescope, as well as with many Earth-based instruments, show the effect well, with ghostly images of far-off quasars and galaxies floating beside foreground galaxies. Rather than creating a single image of the distant quasar, however, a gravitational lens creates multiple images. Depending on the shape of the gravitational lens (that is, the gravitational influence on the distant light), the refracted image may be distended and bent into all sorts of odd contortions. Or, if the galaxy is positioned perfectly in line between the quasar and the Earth, then we would see a symmetrical ring of quasars. From an aesthetic perspective, the most perfect gravitational lens is Einstein's Cross, formed by the galaxy PGC 69457 (cross- cataloged as CGCG 378-15) and the quasar QSO 2237+0305 in Pegasus. PGC 69457 is also known informally as Huchra's Lens after its discoverer, John Huchra, professor of cosmology Harvard University. Current estimates place this small, otherwise unspectacular spiral galaxy at 400 million light years away. The quasar lurks far behind at an incredible distance of 8 billion light-years. Were it not for gravitational lensing, the quasar would remain hidden by the galaxy, as the two are nearly in-line as seen from Earth. But as it is, Huchra's lens fractures the ancient light from the quasar into four separate paths that slide around the galaxy just as water flows around a rock in a stream. The end result is not one, but four ghostly images of QSO 2237+0305 surrounding the nucleus of PGC 69457 in a practically perfect diamond pattern. Einstein's Cross lies to the south of the Flying Horse's "head" and "neck" and due west of the Circlet of Pisces. 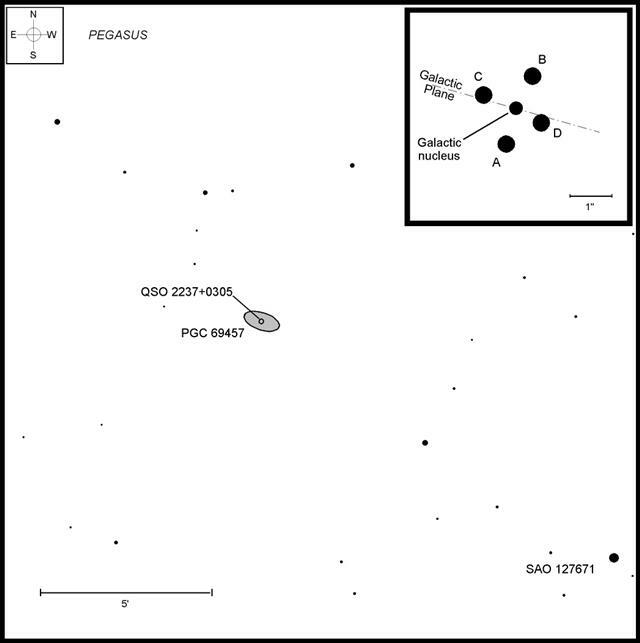 To find it, begin at the star Biham [Theta (θ) Pegasi] and slide 5° southeast to a triangle formed by 34, 35, and 37 Pegasi. Extending a line from 35 Peg through 37 Peg five times (2½°) farther southeast will bring you to the orangish 8th-magnitude star SAO 127671. Centering there, look for an 11th-magnitude star 6' to the northeast. This field star is very handy for gauging distance, as Einstein's Cross is found another 6' farther to its northeast. 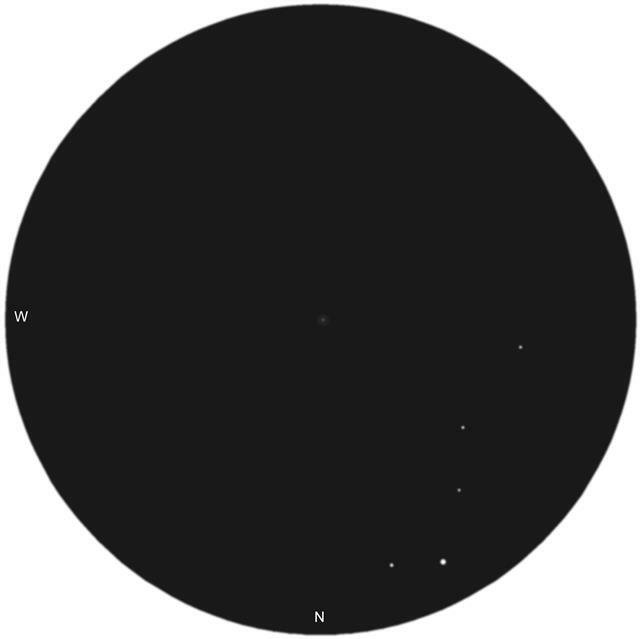 Above: A sketch of Einstein's Cross through the author's 18-inch (46cm) reflector at 411x. Although Einstein's Cross is rated at 15th magnitude, I have seen it with difficulty with my 18-inch reflector from my suburban observing site (naked-eye limiting magnitude 5.0) by using averted vision. But try as I might, even at 411x in those rare moments when seeing briefly permitted such extravagance, all I could see was the faint, nearly stellar object seen in the rendering above. I have never been able to separate the four quasar images from the galaxy; instead, all five remain blurred into a single object. Some other observers have reported success seeing one or two of the lobes while viewing through larger apertures under undoubtedly superior skies. High magnification, and therefore, steady seeing are absolutely required, since the Cross has an angular size of only 1.6 arc-seconds. Be sure to share your results in this column's forum! Remember, half of the fun is the thrill of the hunt. Game on! Phil Harrington's Cosmic Challenge is copyright 2018 by Philip S. Harrington. All rights reserved. No reproduction, in whole or in part, beyond single copies for use by an individual, is permitted without written permission of the copyright holder. 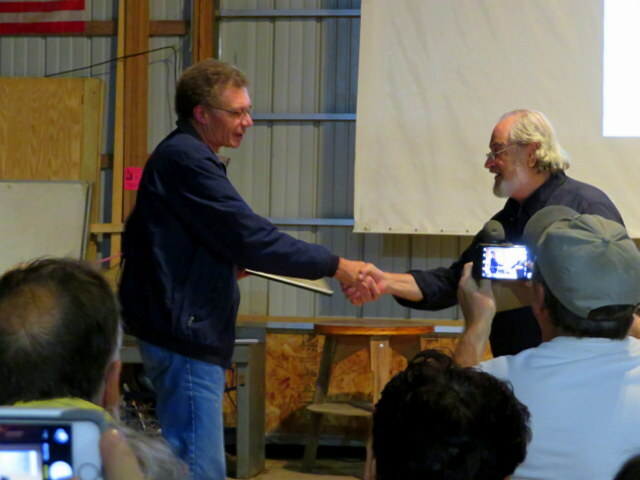 I've observed three of the four components of Einstein's Cross through John Vogt's superb homemade 32" Dob at over 800x under the dark skies of Cherry Springs State Park. The conditions were excellent. A few of the other observers who were present were able to see all four of them. The D component is exceedingly faint. I observed Huchra's Cross during the fall of 2001 with my 28-inch Dob coupled with a Collins I3 image intensifier. My location is fairly dark, but this target was very difficult to spot. The foreground galaxy was surrounded by a faint haze the circled about three-quarters of its shape, the individual points of the quasar not being fully resolved. I now believe that the magnification used was too low for complete resolution. The faintest component of the quasar (or its location) was not visible. I may try for this again on a really transparent and dark night, but my location has been degraded over the past 17 years with the construction of numerous new homes in the area. The best I have done with my 25" is A,B and C with D only suspected. Seeing and transparency were excellent. Magnification was 705x (4.5mm Ethos). The only time I was sure of all four was in the 82" at the McDonald Observatory a few years ago under excellent conditions. Is this something one can image with a 6" scope, moon and sky flow filter and 3-5 minute subs? Or does one have to have a mega aperatire scope to image it? 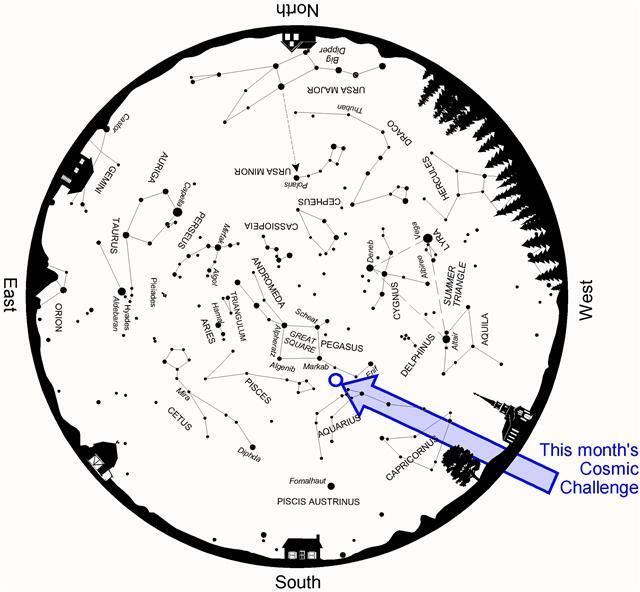 Though off topic, I just read an article in Amateur Astronomy on Stellafane 2018. Congratulations on winning this year's Houston Award! To me, this seems so appropriate. Thanks, John! Yes, I was blown away by the moment. For you \youngsters who might be reading this, Walter Scott Houston, for whom the award is named, was the amateur astronomers’ amateur astronomer in the mid to late 20th century. For decades his name was synonymous with the hobby through his writing and with Stellafane for his very presence. As I was growing up through high school and college, he as a larger than life personality. I had the honor of meeting and speaking him after my first book was published in 1990. I was in awe. He was very gracious to me indeed. To receive an award that bears his name is quite overwhelming for me. I continue to be both humbled and deeply honored. For those who read Scotty's Deep-Sky Wonders column, you probably remember that Phil and other deep-sky giants were mentioned by him. These include the likes of Steve Coe and Ronald J. Morales and others. In many ways Scotty's articles were a "who's who" of our great pursuit. Phil certainly deserves this honor. 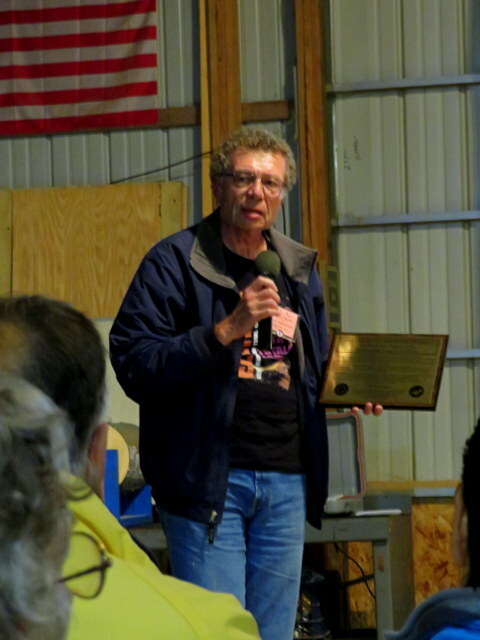 His authorship of several books and articles on amateur astronomy is a labor of love. He won't get rich doing it, but we sure have gained riches through them. Here are a couple of photos of Phil accepting the award. Very interesting, Phil! Though my optics are not up to this challenge, I simply loved learning about the "light bending", etc. Amazing Universe! My biggest scope is a 12.5", so likewise, my scope is not up to this one! Really enjoy your column and reading your book "Cosmic Challenge." Even if my scope's are not of sufficient aperture I still learn a lot from from your writings. And, congratulations on your award. Thanks, Lawrence! I'll keep 'em coming. Congratulations on the Houston Award! In Aug. 1997 I attended one of our famous Manning Park Star Parties, about a 4 Hr. drive east of Vancouver B.C.. On the Sat. night while Gary Wolanski were observing through my !4.5 inch Doby, R.A.S.C. member Dr. Lee Johnson comes walking up from down the road. He says, "Hey Ralph, I've got something really cool in my !7.5 inch, you and Gary should walk down to my scope and have a look". On the way, Lee told us that we would be looking at something called "Einstein's cross", he gave us info on what it was and described what we would be seeing. At the scope, he climbed the short step stool and recentered the object. I went first. In the field of the eyepiece, cannot for the life of me remember what eyepiece he was using, I saw a large number of stars. Then, on the left side something interesting caught my eye. And there it was, in all it's glory. A star in the middle of what used to look like one of those jumping jack stars, a star on top, one on the bottom, one to the left and one to the right all framed the middle star. That was, BTW, exactly what Lee described it should look like.